Dallas Cowboys cornerback Orlando Scandrick said on SI Now on Wednesday that he fully expects wide receiver Dez Bryant to be suiting up for the team next year. Bryant is set to enter unrestricted free agency next month. Among the other Cowboys starters who will become unrestricted free agents is running back DeMarco Murray, who led the NFL with 1,845 rushing yards this season. 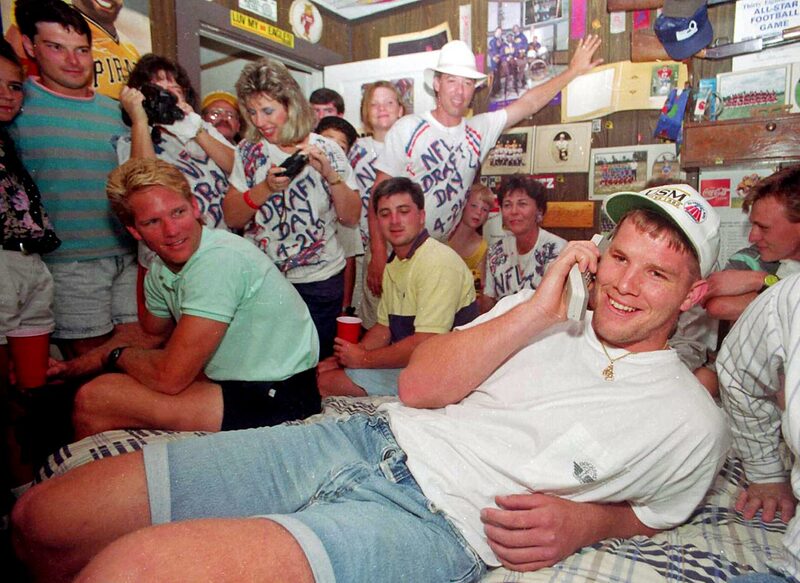 Brett Favre talks to the Atlanta Falcons from his bedroom on NFL draft day in 1991. Favre was drafted in the second round by the Falcons, and later traded to the Packers. 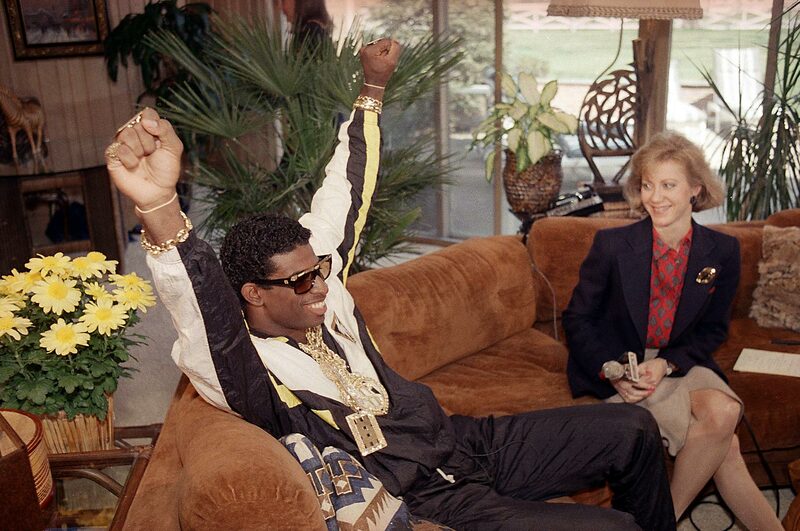 Florida State's Deion Sanders reacts as he sits with television reporter Andrea Kremer at his agent's suburban home in 1989. Sanders was selected by the Atlanta Falcons with the fifth pick in the first round. 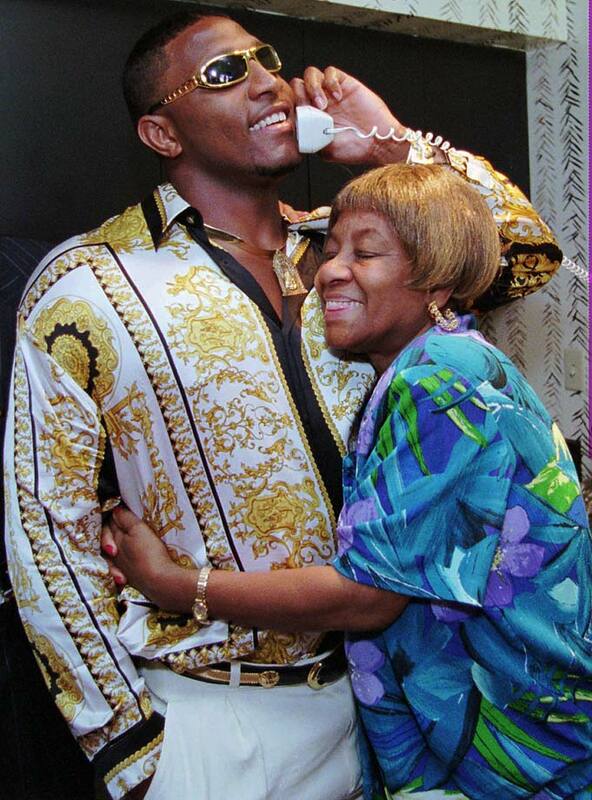 Ray Lewis is hugged by his grandmother Elease while speaking with the Baltimore Ravens after being taken in the first round of the 1996 draft. 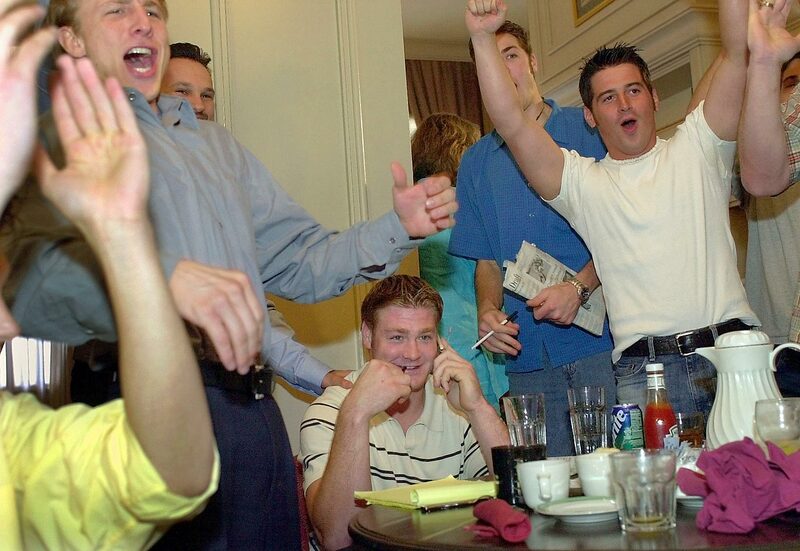 Miami tight end Jeremy Shockey chats on the phone with New York Giants officials as friends and family react to his selection at No. 14 in the 2002 draft. California quarterback Kyle Boller, far right, reacts as he learns that he has been drafted 19th by the Baltimore Ravens in the 2003 draft. 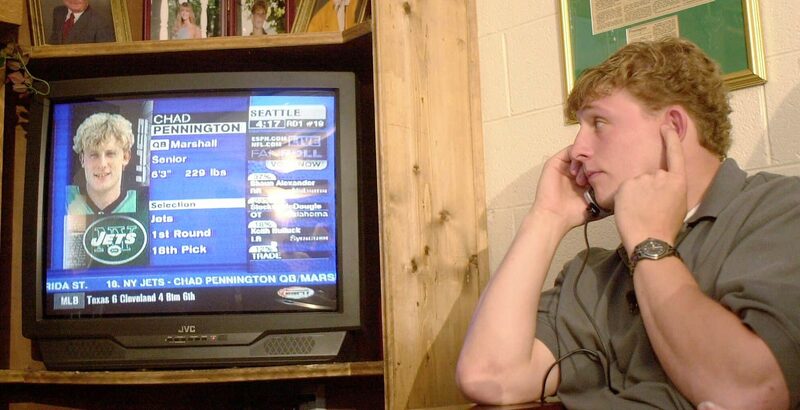 Purdue quarterback Drew Brees and his girl friend react to his selection by the San Diego Chargers with the 32nd pick in the 2001 draft. 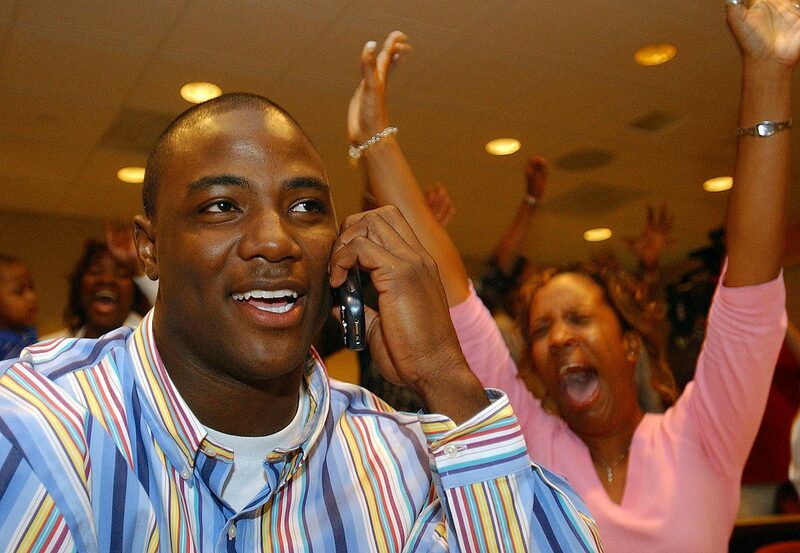 Troy defensive end DeMarcus Ware, seated next to his fiancee, reacts to news that the Dallas Cowboys had selected him in the first round of the 2005 draft. 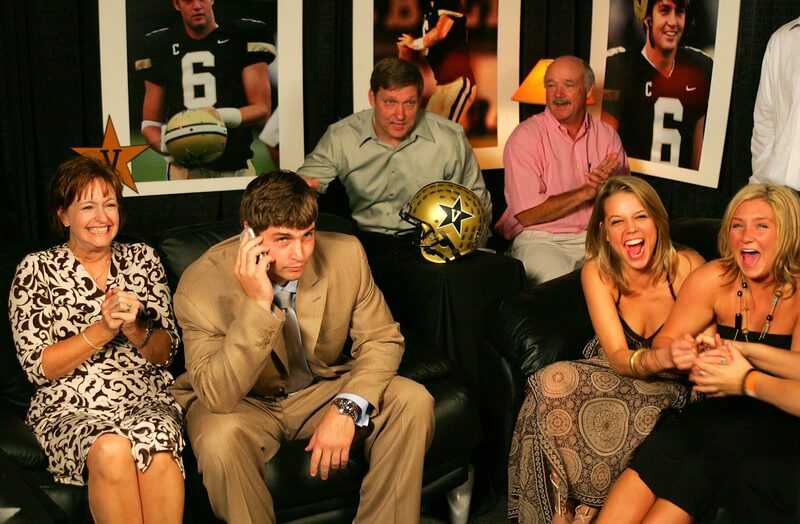 Vanderbilt University quarterback Jay Cutler and his family get the news that he was taken 11th by the Denver Broncos in the 2006 draft. Cutler was at a restaurant celebrating his birthday on the same day. 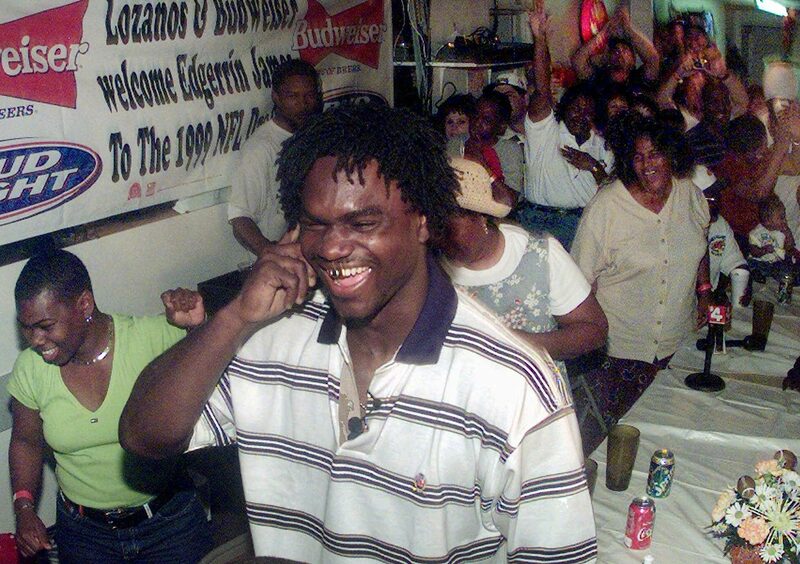 Miami Hurricanes running back Edgerrin James reacts to the news that the Indianapolis Colts chose him with the fourth pick in the 1999 NFL draft. 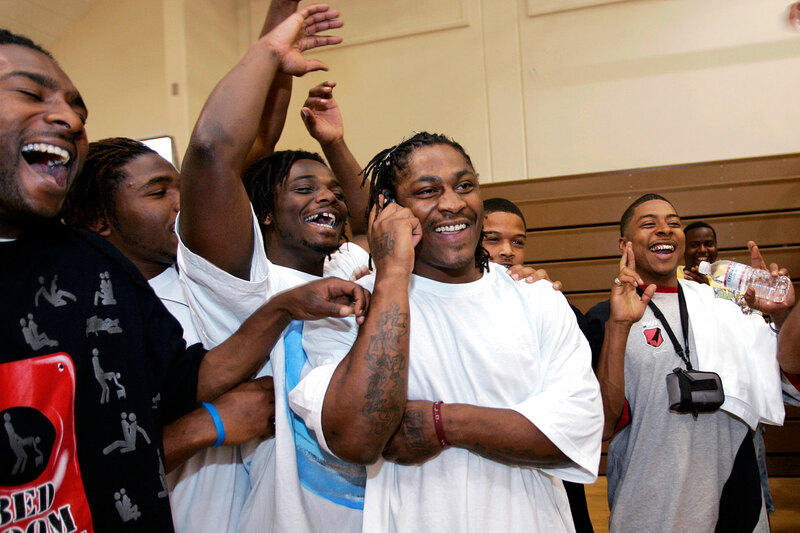 California running back Marshawn Lynch talks on the phone as he is congratulated by supporters at his former high school, Oakland Technical High School, after he was picked by the Buffalo Bills as the No. 12 pick overall in the 2007 draft. 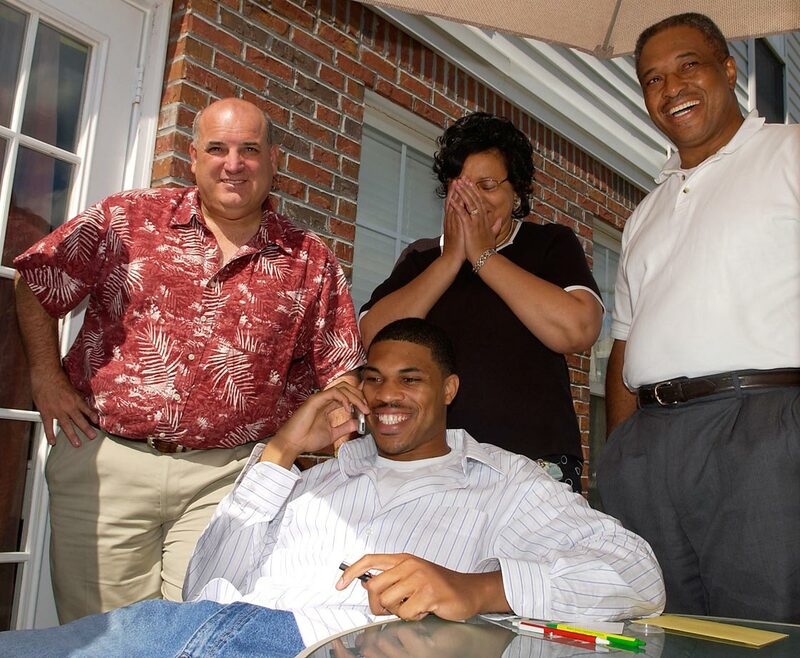 Former Auburn quarterback Jason Campbell talks on the phone with Washington Redskins coach Joe Gibbs after the Redskins selected him with the 25th pick in the 2005 draft. 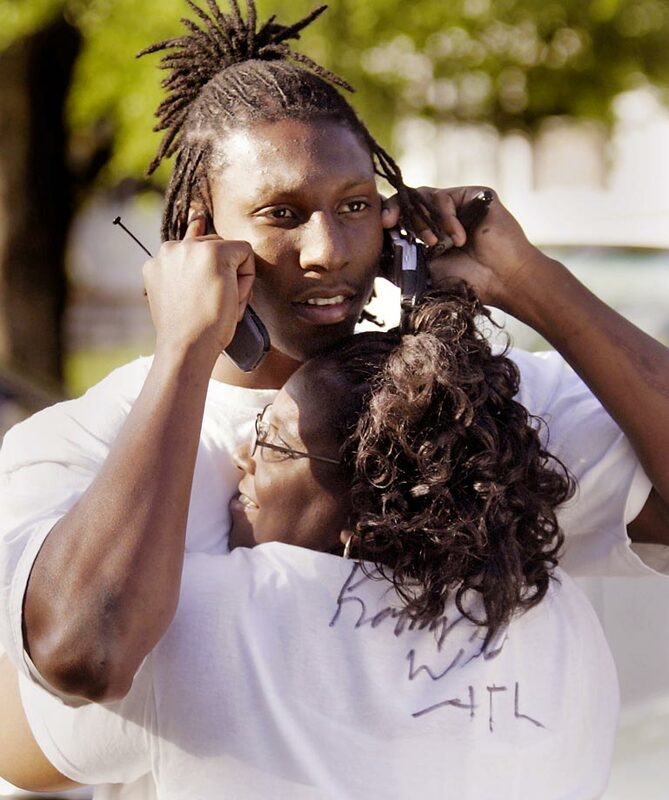 Alabama-Birmingham receiver Roddy White is hugged by his mother as he talks to Atlanta Falcons coach Jim Mora Jr. on one of two cell phones. White was selected 27th overall by the Falcons in the 2005 draft. 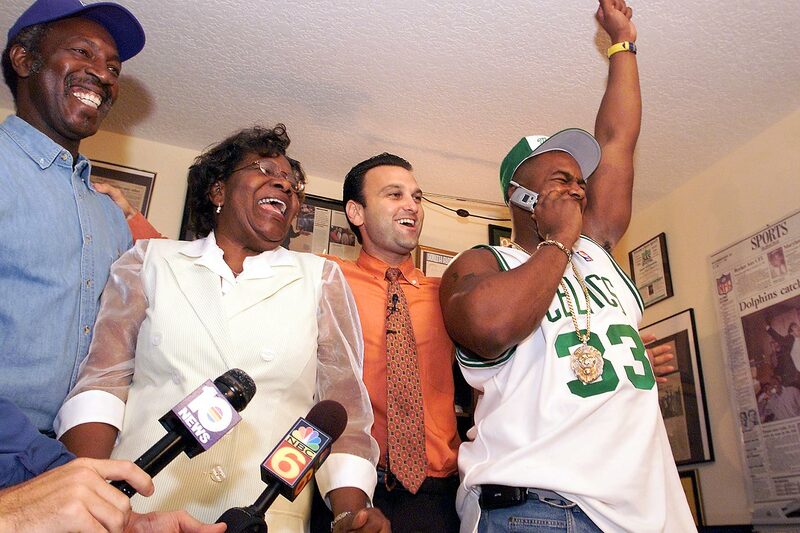 University of Miami running back Willis McGahee has his mother wipe tears after he was picked 23rd by the Buffalo Bills in the 2003 draft. McGahee was the first running back picked that year. 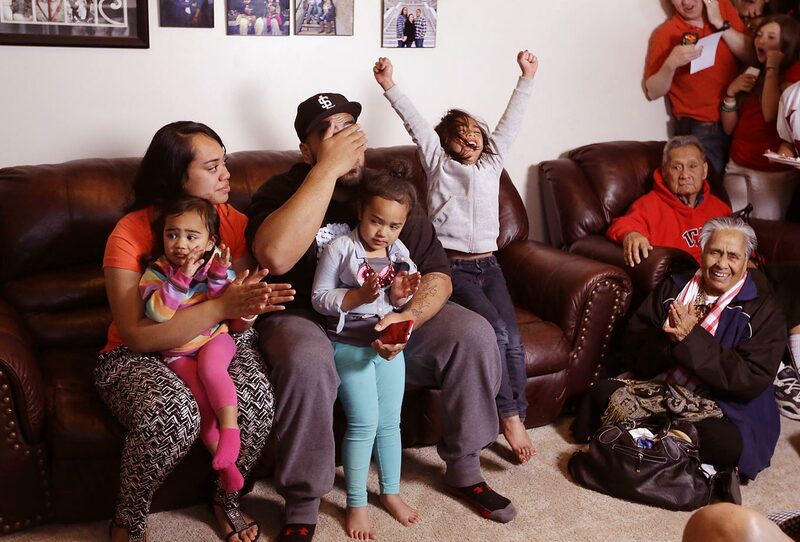 Star Lotulelei, from Utah, reacts next to his wife as they hold their daughters, while his niece cheers after he was selected 14th by the Carolina Panthers in 2013. Ohio State wide receiver Ted Ginn Jr. embraces his mother and girlfriend after receiving a phone call from the Miami Dolphins, who chose him with the No. 9 pick in the 2007 draft. 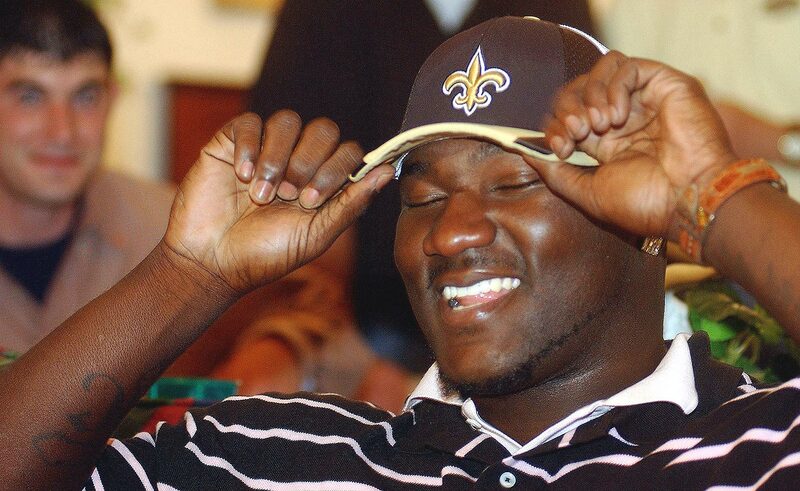 Oklahoma offensive tackle Jammal Brown tries on a New Orleans Saints hat after the Saints selected him 14th in the 2005 draft. 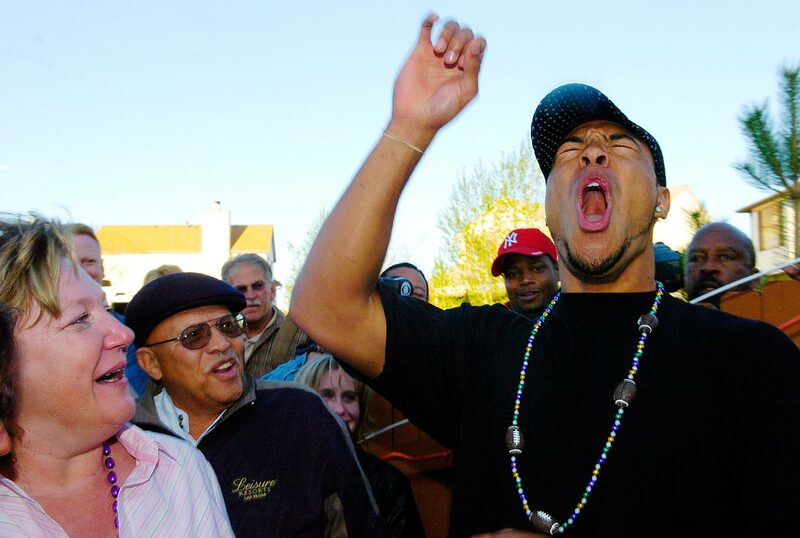 Vincent Jackson celebrates after being drafted in the second round of the 2005 draft, as his mother looks on. 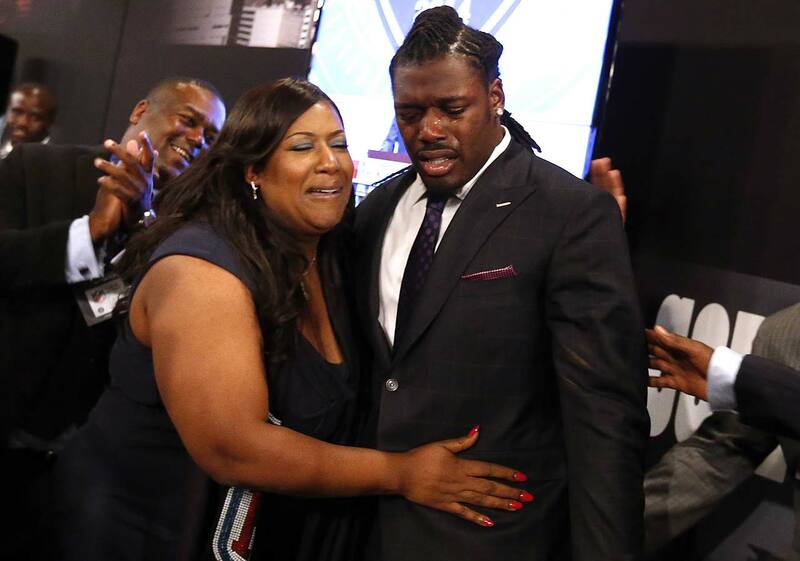 Jadeveon Clowney reacts with his mother, Josenna, after being selected first by the Houston Texans in the 2014 draft at Radio City Music Hall in New York. Auburn running back Carnell Williams talks on his cell phone with Tampa Bay Buccaneers coach Jon Gruden as his mother reacts to the news of Carnell being selected No. 5 by the Bucs in the 2005 draft. Chad Pennington talks with New York Jets coach Al Groth after being selected 18th in the 2000 draft. 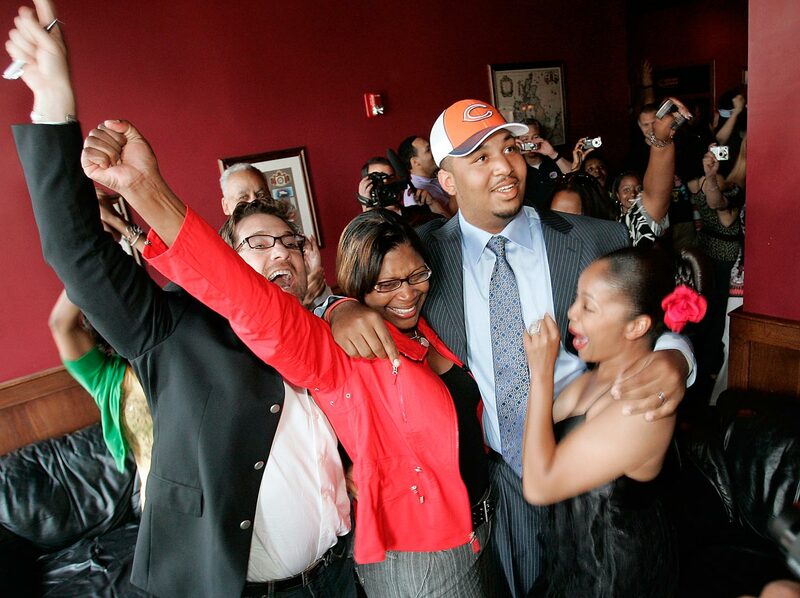 Vanderbilt offensive tackle Chris Williams celebrates as it is announced he has been selected 14th by the Chicago Bears in 2008. 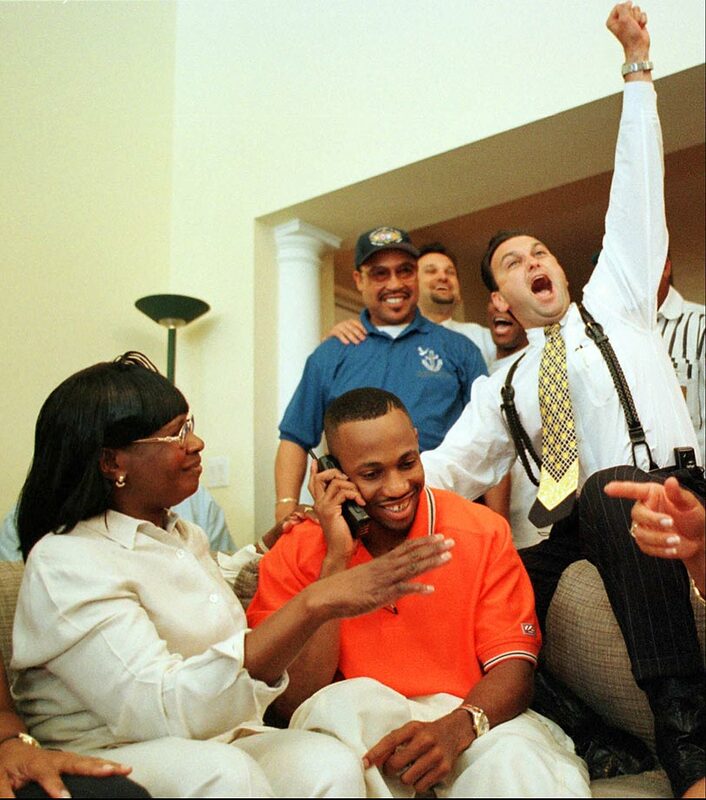 Miami defensive end Jerome McDougle celebrates with his parents and agent after he was taken by the Philadelphia Eagles with the 15th pick in the 2003 NFL draft. 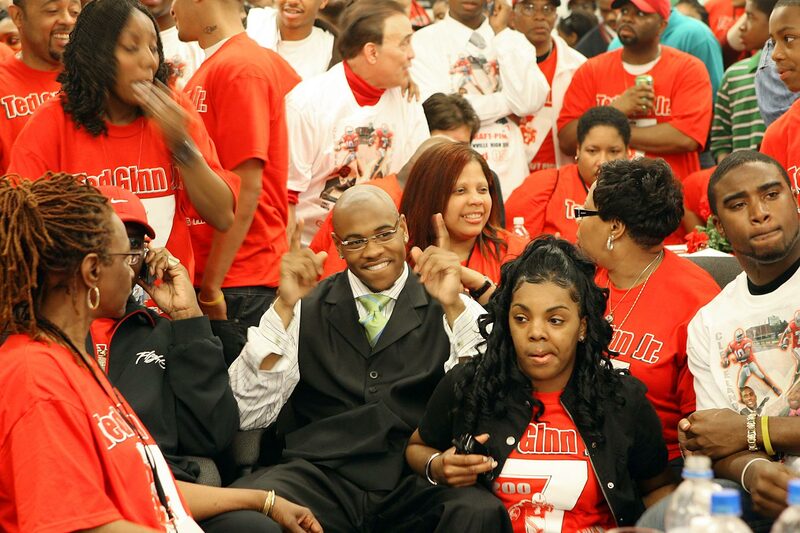 Tennessee defensive tackle John Henderson talks on a cell phone during a family celebration after he was selected No. 9 by the Jacksonville Jaguars in 2002. 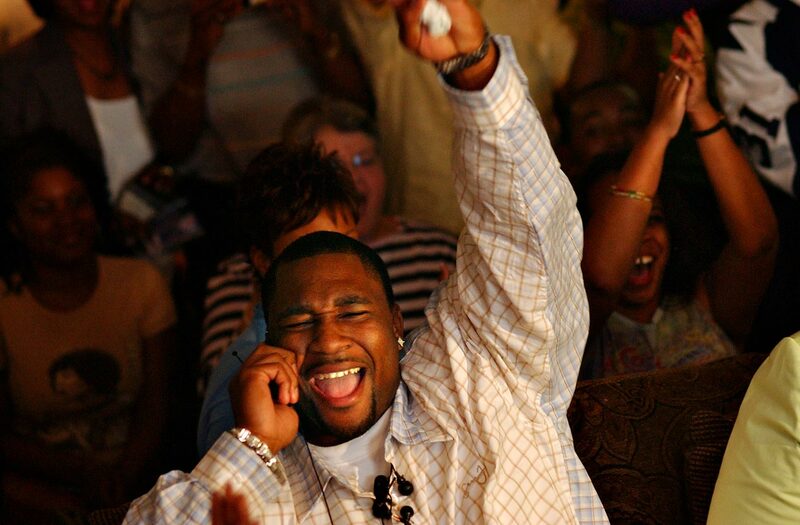 Marcus Spears, who played defensive end for Lousiana State, celebrates while learning he was being drafted 20th by the Dallas Cowboys in 2005. 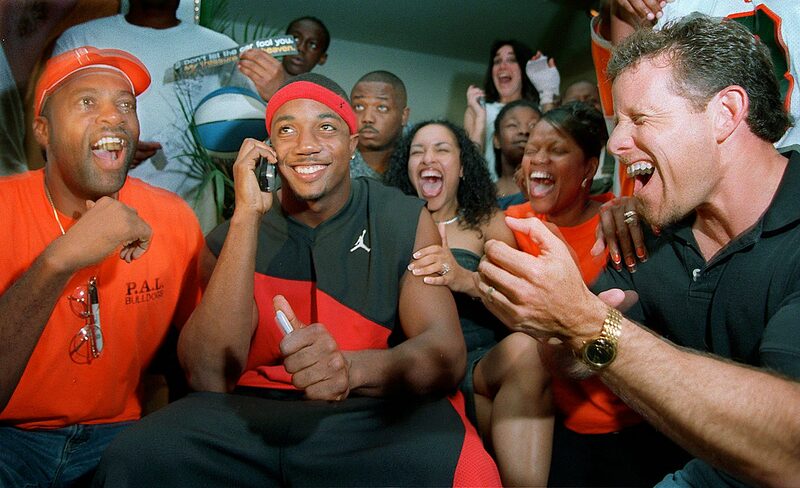 Miami cornerback Mike Rumph gets the call from the San Francisco 49ers that he was selected 27th in the 2002 draft. 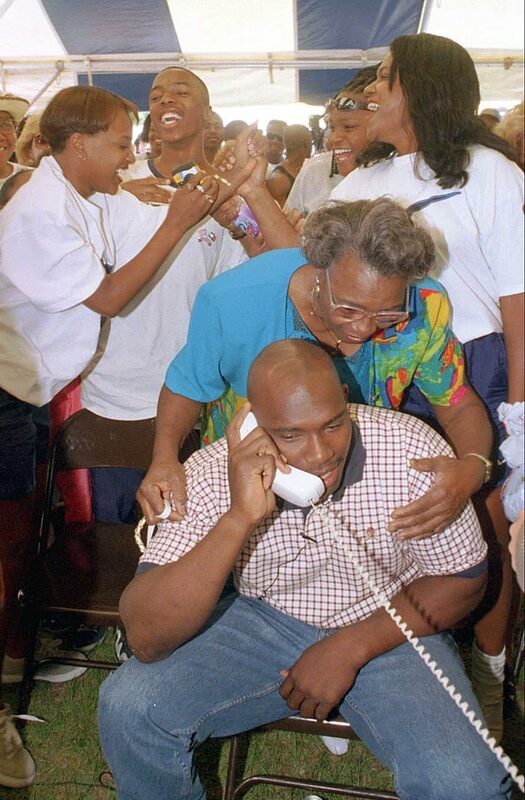 University of Miami defensive back Duane Starks, with his mother seated next to him, smiles as he is informed of being drafted 10th by the Baltimore Ravens in 1998. 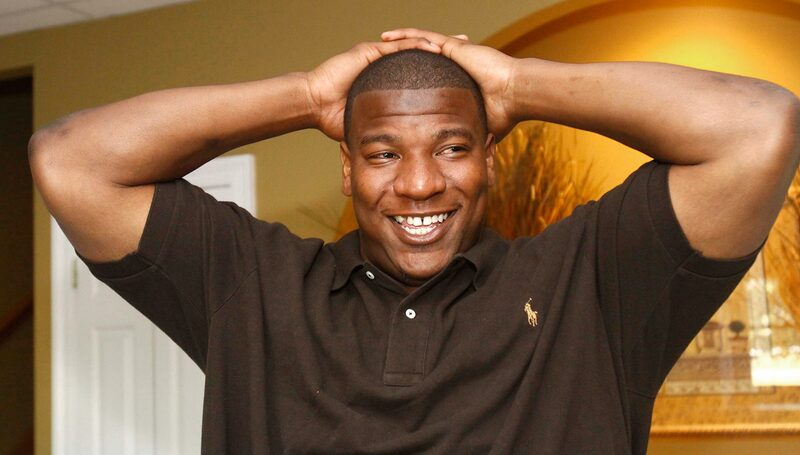 Mississippi defensive tackle Peria Jerry reacts after being chosen 24th by the Atlanta Falcons in 2009. 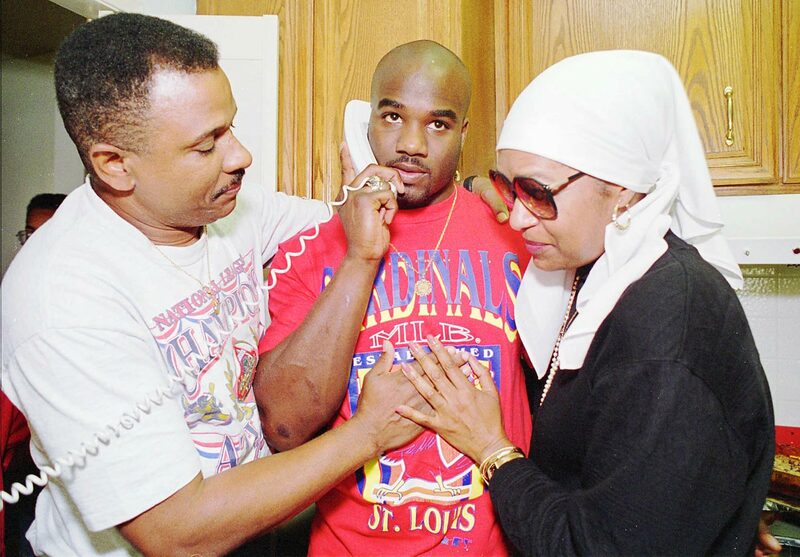 University of Colorado running back Rashaan Salaam is embraced by his mother and his uncle while learning that he had been picked 21st by the Chicago Bears in 1991. Florida State linebacker Reinard Wilson accepts congratulations as he talks to the Cincinnati Bengals, who picked him 14th in the 1997 draft. Notre Dame defensive end Renaldo Wynn, who was taken at No. 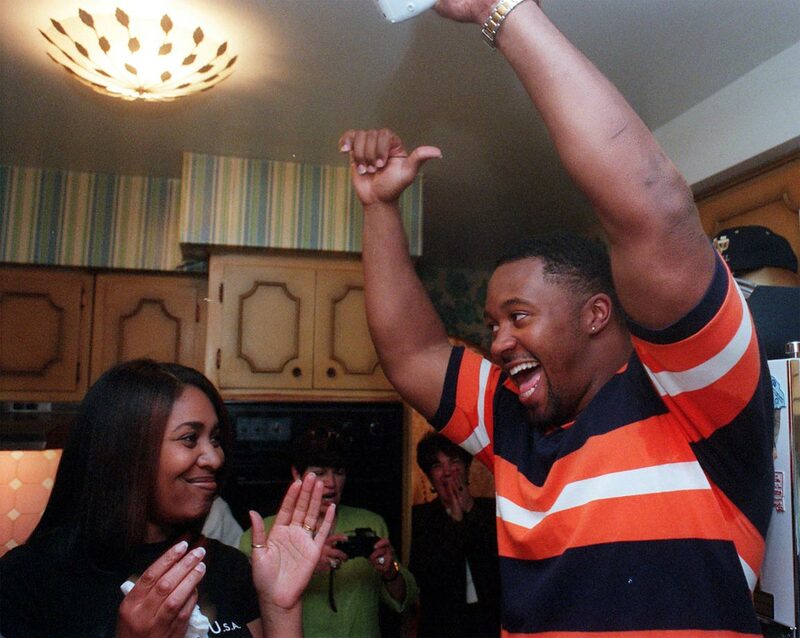 21 by the Jacksonville Jaguars in the 1997 draft, celebrates with his wife. 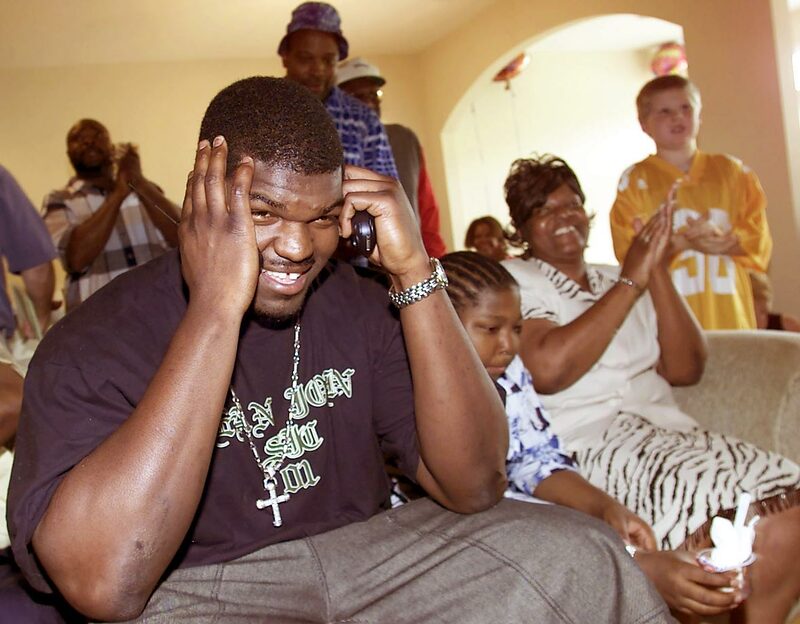 Arkansas offensive tackle Shawn Andrews reacts with his mother and friends after learning he was selected 16th by the Philadelphia Eagles in 2004. 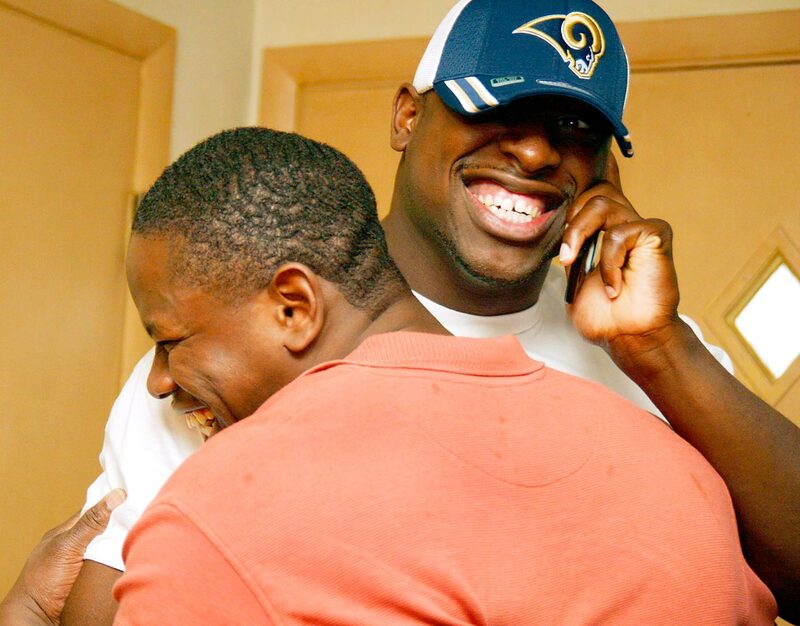 Indiana defensive end Victor Adeyanju is given a celebratory hug by his brother after hearing that he was drafted in the fourth round by the St. Louis Rams in the 2006 draft. "We would love to have DeMarco back, and that's not my decision, but, like I said, it's another one of those situations that will take care of itself," Scandrick said. Bryant has played five seasons with the Cowboys since being selected in the first round of the 2010 draft. Over 16 games this season, he caught 88 passes for 1,320 yards and 16 touchdowns while earning his second Pro Bowl nod.